Garellick, G., Kärrholm, J., Rogmark, C. & Herberts, P. Swedish Hip Arthroplasty Register: Annual Report, 2008. Department of Orthopaedics, Sahlgrenska University Hospital (2009). Streit, M. R. et al. Long-term (20-to 25-year) results of an uncemented tapered titanium femoral component and factors affecting survivorship. Clin Orthop Relat Res 471, 3262–3269, https://doi.org/10.1007/s11999-013-3033-4 (2013). Taylor, W. R. et al. The difference between stretching and splitting muscle trauma during THA seems not to play a dominant role in influencing periprosthetic BMD changes. Clin Biomech 27, 813–818 (2012). Morrey, B. F. Short-stemmed uncemented femoral component for primary hip arthroplasty. Clin Orthop Relat Res 249, 169–175 (1989). van Oldenrijk, J., Molleman, J., Klaver, M., Poolman, R. W. & Haverkamp, D. Revision rate after short-stem total hip arthroplasty: A systematic review of 49 clinical studies. Acta Orthop 85, 250–258 (2014). Kutzner, K. P. et al. Radiographic alterations in short-stem total hip arthroplasty: a 2-year follow-up study of 216 cases. Hip Int 26, 278–283, https://doi.org/10.5301/hipint.5000339 (2016). Freitag, T., Hein, M.-A., Wernerus, D., Reichel, H. & Bieger, R. Bone remodelling after femoral short stem implantation in total hip arthroplasty: 1-year results from a randomized DEXA study. Arch Orthop Trauma Surg 136, 125–130, https://doi.org/10.1007/s00402-015-2370-z (2016). Gabarre, S. et al. Comparative Analysis of the Biomechanical Behaviour of Two Cementless Short Stems for Hip Replacement: Linea Anatomic and Minihip. PLoS One 11, e0158411, https://doi.org/10.1371/journal.pone.0158411 (2016). Schilcher, J., Ivarsson, I., Perlbach, R. & Palm, L. No Difference in Periprosthetic Bone Loss and Fixation Between a Standard-Length Stem and a Shorter Version in Cementless Total Hip Arthroplasty. A Randomized Controlled Trial. Journal of Arthroplasty 32, 1220–1226, https://doi.org/10.1016/j.arth.2016.11.015 (2017). Boucher, F., Pouletaut, P., Munting, E. & Ho Ba Tho, M. C. Retrospective Study of Biomechanical Factors Influencing Early Clinical Results of the Munting Stemless Hip Prosthesis. The Third International Conference on the Development of Biomedical Engineering in Vietnam, IFMBE Proceedings 27, 114–118, https://doi.org/10.1007/978-3-642-12020-6_28 (2010). Cilla, M., Checa, S. & Duda, G. N. Strain shielding inspired re‐design of proximal femoral stems for total hip arthroplasty. J Orthop Res 35, 2534–2544, https://doi.org/10.1002/jor.23540 (2017). Sumner, D., Turner, T., Igloria, R., Urban, R. & Galante, J. Functional adaptation and ingrowth of bone vary as a function of hip implant stiffness. J Biomech 31, 909–917, https://doi.org/10.1016/S0021-9290(98)00096-7 (1998). Engh, C. A. & Bobyn, J. D. The influence of stem size and extent of porous coating on femoral bone resorption after primary cementless hip arthroplasty. Clin Orthop Relat Res 231, 7–28 (1988). Bobyn, J. D. et al. Producing and Avoiding Stress Shielding: Laboratory and Clinical Observations of Noncemented Total Hip Arthroplasty. Clin Orthop Relat Res 274, 79–96 (1992). Sumner, D. R. & Galante, J. O. Determinants of stress shielding: design versus materials versus interface. Clin Orthop Relat Res 274, 202–212 (1992). van Rietbergen, B. & Huiskes, R. Load transfer and stress shielding of the hydroxyapatite-ABG hip: a study of stem length and proximal fixation. Journal of Arthroplasty 16, 55–63 (2001). Polgar, K., Viceconti, M. & Connor, J. A comparison between automatically generated linear and parabolic tetrahedra when used to mesh a human femur. Proc Inst Mech Eng H 215, 85–94, https://doi.org/10.1243/0954411011533562 (2001). Wieding, J., Souffrant, R., Fritsche, A., Mittelmeier, W. & Bader, R. Finite element analysis of osteosynthesis screw fixation in the bone stock: an appropriate method for automatic screw modelling. PLoS One 7, e33776, https://doi.org/10.1371/journal.pone.0033776 (2012). Schileo, E. et al. An accurate estimation of bone density improves the accuracy of subject-specific finite element models. J Biomech 41, 2483–2491, https://doi.org/10.1016/j.jbiomech.2008.05.017 (2008). Schileo, E., Taddei, F., Malandrino, A., Cristofolini, L. & Viceconti, M. Subject-specific finite element models can accurately predict strain levels in long bones. J Biomech 40, 2982–2989, https://doi.org/10.1016/j.jbiomech.2007.02.01 (2007). Heyland, M. et al. Selecting boundary conditions in physiological strain analysis of the femur: Balanced loads, inertia relief method and follower load. Med Eng Phys 37, 1180–1185, https://doi.org/10.1016/j.medengphy.2015.10.002 (2015). Müller, L. A. et al. Seventeen-year survival of the cementless CLS Spotorno stem. Arch Orthop Trauma Surg 130, 269–275, https://doi.org/10.1007/s00402-009-0969-7 (2010). Aldinger, P. R., Jung, A. W., Breusch, S. J., Ewerbeck, V. & Parsch, D. Survival of the cementless Spotorno® stem in the second decade. Clin Orthop Relat R 467, 2297–2304, https://doi.org/10.1007/s11999-009-0906-7 (2009). Vidalain, J.-P. Twenty-year results of the cementless Corail stem. Int Orthop 35, 189–194, https://doi.org/10.1007/s00264-010-1117-2 (2011). Karachalios, T. et al. The long-term clinical relevance of calcar atrophy caused by stress shielding in total hip arthroplasty: A 10-year, prospective, randomized study1 1No benefits or funds were received in support of this study. Journal of Arthroplasty 19, 469–475 (2004). Heller, M. O. et al. Musculo-skeletal loading conditions at the hip during walking and stair climbing. J Biomech 34, 883–893, https://doi.org/10.1016/S0021-9290(01)00039-2 (2001). Speirs, A. D., Heller, M. O., Duda, G. N. & Taylor, W. R. Physiologically based boundary conditions in finite element modelling. J Biomech 40, 2318–2323, https://doi.org/10.1016/j.jbiomech.2006.10.038 (2007). Szwedowski, T. D. et al. Generic rules of mechano-regulation combined with subject specific loading conditions can explain bone adaptation after THA. PLoS One 7, e36231, https://doi.org/10.1371/journal.pone.0036231 (2012). Aamodt, A. et al. 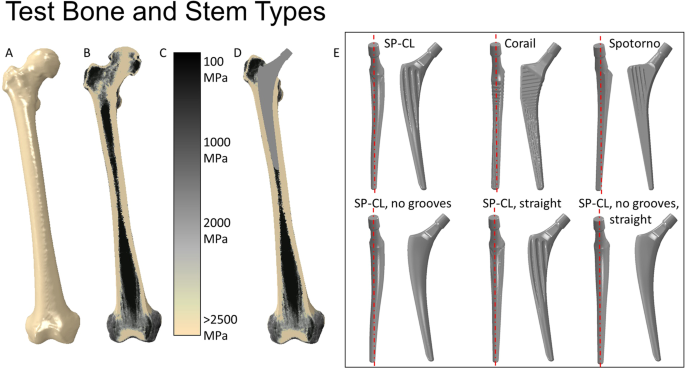 In vivo measurements show tensile axial strain in the proximal lateral aspect of the human femur. J Orthopaed Res 15, 927–931, https://doi.org/10.1002/jor.1100150620 (1997). Taylor, M., Tanner, K., Freeman, M. & Yettram, A. Stress and strain distribution within the intact femur: compression or bending? Medical engineering & physics 18, 122–131, https://doi.org/10.1016/1350-4533(95)00031-3 (1996). Inaba, Y. et al. Difference in postoperative periprosthetic bone mineral density changes between 3 major designs of uncemented stems: a 3-year follow-up study. Journal of Arthroplasty 31, 1836–1841, https://doi.org/10.1016/j.arth.2016.02.009 (2016). Bieger, R. et al. Primary stability and strain distribution of cementless hip stems as a function of implant design. Clin Biomech 27, 158–164, https://doi.org/10.1016/j.clinbiomech.2011.08.004 (2012). Chanda, S., Dickinson, A., Gupta, S. & Browne, M. Full-field in vitro measurements and in silico predictions of strain shielding in the implanted femur after total hip arthroplasty. P I Mech Eng H 229, 549–559, https://doi.org/10.1177/0954411915591617 (2015). Cristofolini, L. A critical analysis of stress shielding evaluation of hip prostheses. Crit Rev Biomed Eng 25, 409–483 (1997). Schiessl, H., Frost, H. & Jee, W. Estrogen and bone-muscle strength and mass relationships. Bone 22, 1–6 (1998). Decking, R., Puhl, W., Simon, U. & Claes, L. E. Changes in strain distribution of loaded proximal femora caused by different types of cementless femoral stems. Clin Biomech (Bristol, Avon) 21, 495–501, https://doi.org/10.1016/j.clinbiomech.2005.12.011 (2006). Aamodt, A. et al. Changes in proximal femoral strain after insertion of uncemented standard and customised femoral stems. J Bone Joint Surg Br 83, 921–929 (2001). Chanda, S., Gupta, S. & Pratihar, D. K. A genetic algorithm based multi-objective shape optimization scheme for cementless femoral implant. J Biomech Eng 137, 034502, https://doi.org/10.1115/1.4029061 (2015). Ruben, R. B., Fernandes, P. R. & Folgado, J. On the optimal shape of hip implants. J Biomech 45, 239–246, https://doi.org/10.1016/j.jbiomech.2011.10.038 (2012). Issa, K. et al. Radiographic fit and fill analysis of a new second-generation proximally coated cementless stem compared to its predicate design. Journal of Arthroplasty 29, 192–198, https://doi.org/10.1016/j.arth.2013.04.029 (2014). Laine, H.-J. et al. The effects of cementless femoral stem shape and proximal surface texture on’fit-and-fill’characteristics and on bone remodeling. Int Orthop 24, 184–190, https://doi.org/10.1007/s002640000150 (2000). Inaba, Y., Ike, H., Oba, M. & Saito, T. In Perusal of the Finite Element Method (InTech, 2016). Oba, M. et al. Effect of femoral canal shape on mechanical stress distribution and adaptive bone remodelling around a cementless tapered-wedge stem. Bone Joint Res 5, 362–369, https://doi.org/10.1302/2046-3758.59.2000525 (2016). Speirs, A. D., Heller, M. O., Taylor, W. R., Duda, G. N. & Perka, C. Influence of changes in stem positioning on femoral loading after THR using a short-stemmed hip implant. Clin Biomech 22, 431–439, https://doi.org/10.1016/j.clinbiomech.2006.12.003 (2007). Dopico-González, C., New, A. M. & Browne, M. Probabilistic finite element analysis of the uncemented hip replacement—effect of femur characteristics and implant design geometry. J Biomech 43, 512–520, https://doi.org/10.1016/j.jbiomech.2009.09.039 (2010). Kutzner, K. P., Freitag, T., Donner, S., Kovacevic, M. P. & Bieger, R. Outcome of extensive varus and valgus stem alignment in short-stem THA: clinical and radiological analysis using EBRA-FCA. Arch Orthop Trauma Surg 137, 431–439, https://doi.org/10.1007/s00402-017-2640-z (2017). Dossick, P. H., Dorr, L. D., Gruen, T. & Saberi, M. T. Techniques for preoperative planning and postoperative evaluation of noncemented hip arthroplasty. Techniques in orthopaedics 6, 1–6 (1991). Dorr, L., Absatz, M., Gruen, T., Saberi, M. & Doerzbacher, J. In Seminars in arthroplasty Vol. 1 77–86 (1990). Schmidutz, F. et al. Influence of different sizes of composite femora on the biomechanical behavior of cementless hip prosthesis. Clin Biomech (Bristol, Avon) 41, 60–65, https://doi.org/10.1016/j.clinbiomech.2016.12.003 (2017).